Daftary, Farhad, The Isma'ilis: Their History and Doctrines. 2nd ed (1990). Cambridge et al., 2007. Irwin, Robert. "Islam and the Crusades, 1096–1699". In The Oxford History of the Crusades, ed. Jonathan Riley Smith. Oxford, 2002. 211–57. Hassan-i Sabbah, al-Fuṣūl al-arba'a ("The Four Chapters"), tr. Marshall G.S. Hodgson, in Ismaili Literature Anthology. A Shi'i Vision of Islam, ed. Hermann Landolt, Samira Sheikh and Kutub Kassam. London, 2008. pp. 149–52. Persian treatise on the doctrine of ta'līm. The text is no longer extant, but fragments are cited or paraphrased by al-Shahrastānī and several Persian historians. Daftary, Farhad, A Short History of the Ismā'īlīs. Edinburgh: Edinburgh University Press, 1998. 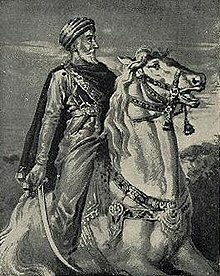 Daftary, Farhad, "Hasan-i Sabbāh and the Origins of the Nizārī Ismā'īlī movement." In Mediaeval Ismā'īlī History and Thought, ed. Farhad Daftary. Cambridge: Cambridge University Press, 1996. 181–204. Hodgson, Marshall, The Order of Assassins. The Struggle of the Early Nizārī Ismā'īlī Against the Islamic World. The Hague: Mouton, 1955. Hodgson, Marshall, "The Ismā'īlī State." In The Cambridge History of Iran, vol. 5: The Saljuq and Mongol Periods, ed. J.A. Boyle. Cambridge: Cambridge University Press, 1968. 422–82. Lewis, Bernard, The Assassins. A Radical Sect in Islam. New York: Basic Books, 1968. Madelung, Wilferd, Religious Trends in Early Islamic Iran. Albany: Bibliotheca Persica, 1988. 101–5. The life of Hassan-i-Sabah from an Ismaili point of view. Focuses on assassination as a tactic of asymmetrical warfare and has a small section on Hasan-i-Sabah's work as a scholar. The life of Hassan-i-Sabbah as part of an online book on the Assassins of Alamut. An illustrated article on the Order of Assassins. William S. Burrough's invocation of Hassan-i-Sabbah in Nova Express. Assassins entry in the Encyclopedia of the Orient.